Reading water meters is made more difficult in that some are not read frequently and so they get hidden by weeds, dirt blown by the wind, etc. In order to make finding them easier a number of products were developed, the Aqua Locator is one of them. This product is not a "water witching" device but rather a magnetic dip needle that's optimized for locating ferrous metal in the ground, like a water meter, but can be used for finding any ferrous metal that's relatively near the surface. 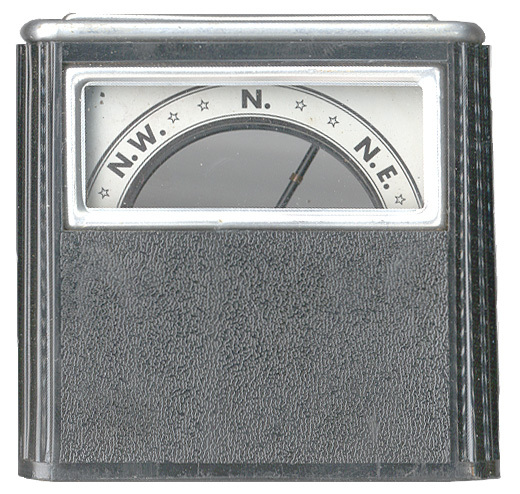 It's a compass that works on the up-down part of the field (which is stronger than the horizontal field in most of North America). I don't have a manual for this instrument, if you do please contact me. When the instrument is turned face up it acts like a conventional azimuth compass, except the window only displays the cardinal directions NW - N - NE, but by turning the case you can get the Red end of the needle to point North. Then the Aqua Locator is held a few inches off the ground using the carry strap and is oriented with the North arrow on the case pointing North. Now maintaining the North direction slowly move the locator over the area where ferrous metal might be located and look down at the image of the needle in the 45 degree mirror. When over ferrous metal the needle will move to a vertical position. When I brought the locator over a metal stake that was driven into the ground with a sledge hammer the needle flipped over, i.e. instead of seeing the Red end the Black end was pointing up! The stake probably was made into a magnet when pounded into the ground. AND OTHER CONCENTRATED FERROUS METAL OBJECTS. "N". You now have true north position. you walk. Be sure that "N" is still pointing north. until the red end of the needle dips and the black end of the needle appears. path. This is the location of missing valve box or stake. to "90" mark cannot be expected. In cases of this kind, "70" or "75" may be the best reading obtainable. In areas where there are high voltage overhead wires, there is usually electrical disturbance, which will cause the red end of the needle to show on dial. This does not hamper location operations. 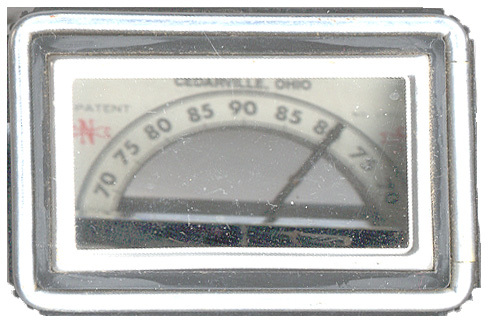 When over the object, red end will disappear and black end will appear on dial. against possible damage from bumps and jolts. THE AQUA SURVEY & INSTRUMENT CO. These show up on eBay from time to time. This is the page created 5 July 2003.